After last year’s sold out race with 400 entries, we decided to increase the entry limit to 500 for 2019. We were completely blown away to see all 500 places sell out in just 19 days! This is a fantastic tribute to how much everyone has enjoyed the event over the past few years and great reward for us that all the hard work has paid off. To see so many smiling faces on the night is brilliant! It’s not just the adults that enjoy themselves, we pride ourselves on providing an event for all ages, with our other two races being suitable for the younger runners too. We have the newly renamed Trail Taster 3.6km (previously called 3.6km Fun Run) and also the 500 metre Fun Run. The Trail Taster 3.6km race, suitable for older kids and adults, is a great way to try out trail running. Entries are still available via Sports Entry Solutions here or enter on the night (just £5 to enter). The Fun Run is approximately 500 metres long and is suitable for children of 9 years and under (parents can run with them too). Entries for this race are only taken on the night (£1.50 to enter). If you can no longer participate in our race, entries can be transferred up to Friday 7th June 2019. If you have someone who can take your place, you can transfer it on Sports Entry Solutions website by using the Unique Reference number that you were sent when registering for the race. If you don’t know anyone who wants your place, we have a waiting list. 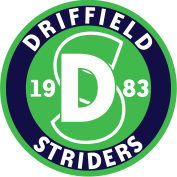 Please email info@driffieldstriders.co.uk and we can help to transfer your place. Your race number and timing chip will be available for collection upon arrival at Sledmere House on the day of the race. Please allow enough time for this! After we received so much positive feedback about last years finshers medal, we have decided to design another one for 2019. However, there is one subtle change which we’re sure will go down well. You’ll have to wait to see what it is! There will be a change to the car parking arrangements for 2019. We will be using a larger car park due to the increase in the number of participants. Please do not attempt to park in the car park by the entrance to Sledmere House. Instead, follow the race car park signs and marshalls who will direct you to the correct parking area. Parking is free of charge. This year’s main race sponsor will be Woolley & Parks. Following their successful sponsorship of our race in 2018, they have decided to continue our partnership. The gift shop will be open selling a range of snacks and hot and cold beverages. There will be toilets available at the gift shop and also portaloo’s at the race start/finish area. As the event is held within the grounds of a stately home, it’s imperative that only these toilet facilities are used and no ‘au naturel’ alternatives are sought. Dogs are welcome at Sledmere House. The only requests are that they are kept on a lead at all times and any dog waste should be cleared and placed within the bins in the grounds. © 2019 Driffied Striders. All rights reserved.